Size: wingspan - 74 ft., length - 54 ft. Weight:empty 17,000 lb., loaded 30,865 lb. Speed/Range: 258 MPH at 16,000 ft.; climb to 14,765 ft. in 30-35 minutes; range 745 miles; ceiling 25,600 ft. Weapons: usually four machine guns and one 20mm cannon; bombload up 4,410 lbs. The twin engine Heinkel bomber touched down on the icy runway. At minus 20 degrees Celsius and with the wind howling at 30MPH, it was a huge effort for the beleaguered ground crew just to unload the bomber-turned-transport. 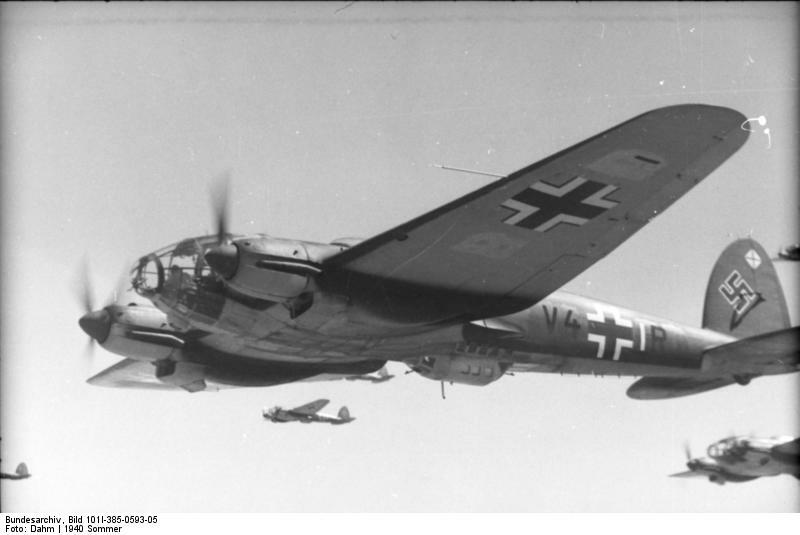 Capable of carrying over two tons of bombs, this day the Heinkel He 111 was laden with ammunition, food, and medical supplies for the German Sixth Army. Weather was not the only problem. The airfield at Pitomnik attracted all the enemy's attention, so shot-up and crashed aircraft frequently made it unusable. Burnt-out metal carcasses were pushed out into the snow beside the runway, forming a widely strewn machine graveyard. Landing by night was doubly dangerous. The air-defence batteries at Pitomnik had an almost impossible balance to maintain. They needed to use searchlights to pick out Soviet night bombers, but the base of their beams provided a target for Russian artillery. The strain on Luftwaffe aircrew was intense. Young and inexperienced aircrews were badly shaken by the sights at Pitomnik, above all the miserable condition of the wounded waiting by the side of the runway for evacuation, and the piles of frozen corpses, left by the field hospital there because the ground was frozen too hard to bury them. The effort was doomed; there were not enough planes to fly in the required 500 tons per day. Notwithstanding the debacle at Stalingrad, the Heinkel He 111 had a long and successful career, from its inception, allegedly as a civilian airliner, through the Spanish Civil War, the Battle of Britain, Stalingrad, and even after World War Two, in service with the air forces of Spain, Turkey, and other countries. The first He 111, with elliptical wings and tail, looked to be a graceful civilian airliner when it was publicly disclosed in 1936. 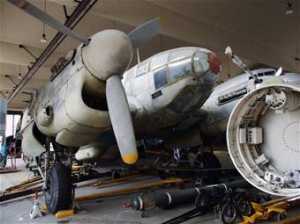 With two 660hp engines (BMW VIs), the airplane, in its secret role as a bomber, could carry 1000kg (2,200lb) of bombs. In 1937, the He 111B-1 came openly into Luftwaffe service, equipped with 880hp Daimler Benz DB 600C engines. In February 1937, the German Condor Legion began flying in Spain, in support of Franco's Nationalists in the Civil War. The B-2, equipped with 950hp DB 600CG engines, met considerable success in this conflict, infamously with the indiscriminate bombing of Guernica in July. 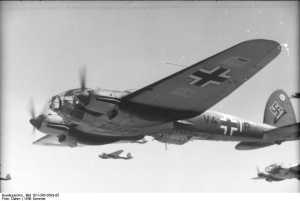 As a result, the Luftwaffe drew exaggerated conclusions from this experience, thinking that masses of medium bombers like the He 111 would be irresistible. In fact, even the vastly more lethal four-engine heavy bombers of the U.S. Eighth Air Force were not sufficient, by themselves, to bring an industrial country to its knees. In the late 1930s, these early models of the He 111 (the B, D, and E) were considered very fast for the time. Only carrying three machines, they could make a respectable speed. 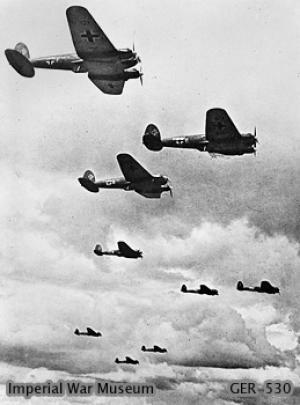 But, in the Battle of Britain, the Hurricanes and Spitfires cut them down, leaving the Luftwaffe with no recourse but to arm the bombers with more defensive firepower: additional machine guns in the nose and tail, and a 20mm cannon in the ventral gondola, necessarily with more crew to serve the guns. And all this slowed the Heinkels considerably. 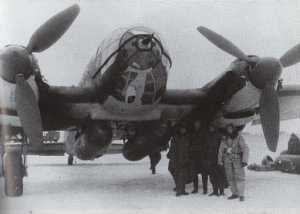 In short, by 1942, the He 111 was an outmoded design, no longer capable of supporting powerful enough engines. And by this time, it was too late to begin development of a replacement, and the Reich continued to crank them out, about 7,000 overall, by late 1944 when almost all bomber production ceased, in favor of desperately needed fighters. First flown in February, 1935. First major bomber production type with two DB 600 engines. Did not enter large-scale production. Both powered by the Jumo motor. Extensively revised, glazed nose, with offset ball turret. Using the updated Daimler-Benz DB 601, it was produced in small numbers. The H variant of the He 111 series was more widely produced and saw more action during the Second World War than any other Heinkel variant. Similar to the P version, but using the 1,100 hp (820 kW) Junkers Jumo 211 engine, over 5,000 were built by late 1944. While primarily a medium bomber, the H was also adapted as a torpedo bomber, a glider-bomb carrier, and even as a balloon-cable cutter. 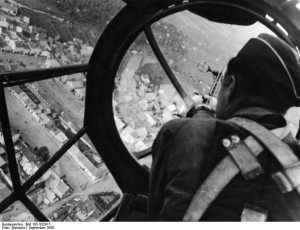 It's not easy to find a website dedicated to images and photos of the He 111. The Imperial War Museum has a few. 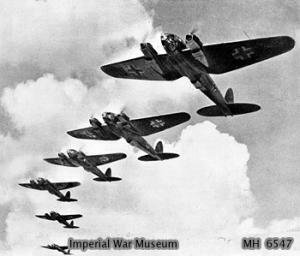 While the museum has a very large collection of photographs, only medium/small sized images are available online (such as the two at left showing flights of Heinkels during the Battle of Britain; perhaps one can purchase larger images. Jeffrey Brundt built this beautiful Monogram 1/48 scale He 111. There aren't any. Only three He 111's survive, all in museums. The National Museum of the USAF has a CASA 2.111 in storage at its Dayton, Ohio facility, shown in the bottom picture at left. The CASA 2.111 was a medium bomber derived from the Heinkel He 111 and produced in Spain by Construcciones Aeronauticas SA. Following the Spanish Civil War, the Spanish Air Force received a number of He 111Bs from Germany. However, there was a need for more modern aircraft with increased armament, and CASA negotiated a contract with Heinkel in 1940 to produce the newer He 111H-16.